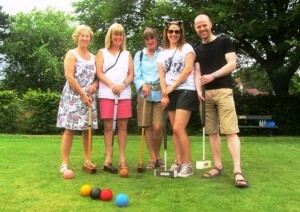 Drop-in Try Croquet taster afternoons are offered regularly through the playing season. These are informal sessions offering have-a-go croquet, information and guidance. No experience of the game is necessary. There is no need to book – just turn up at the York Croquet Club lawns on Scarcroft Green with flat-soled footwear and try the game! Sessions are free of charge and all equipment is supplied. No need to book – just turn up. This is an excellent way to see if croquet is for you by trying a simple version of the game. To find out more about taster sessions, introductory courses, York Croquet Club or the game of croquet, please ring the Club Chairman, John Harris, 01904 620211, or the Secretary, Alison Larard, 01759 368123. We will be pleased to help.